1. Under Commerce Settings, confirm the Account ID that you wish to process on (if you have more than one). 2. Choose the terminal you wish to process on if you have more than one. 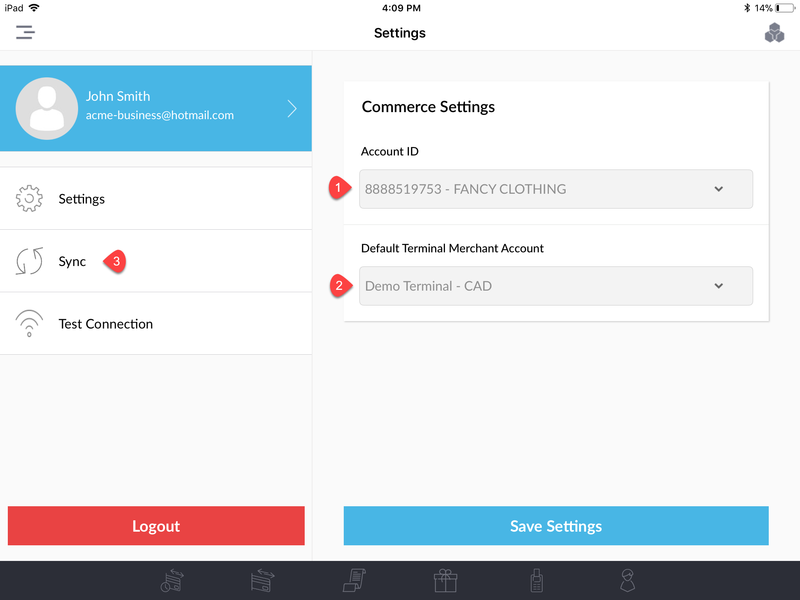 For example, if you have a CAD and a USD account, you would be able to choose which to use in this drop-down menu. 4. On this screen, click Sync and wait for the “Synchronization Complete” message. 5. This will ensure that any changes made in web-based Commerce are reflected in the app and you will see the list of updated items. 7. Choose Begin Test to ensure everything is connected properly. 8. You can also Logout of your account on this page if necessary.